Spoilers for The Flash episode “Fallout” ahead. If you have not watched the episode, turn back now and read another one of our wonderful articles. Firestorm may have been the focus of last night’s episode of The Flash, but it was another guest who stole the spotlight. As per usual, the last minutes of the show included an insane surprise. This week’s moment came from a reunion between General Wade Eiling and the gorilla that he tormented years ago: Grodd! That’s right, “Fallout” provided our best look at Flash's gorilla nemesis yet. After Flash and Firestorm escape from the military, Wells decides he needs to deal with Eiling once and for all. Donning the Reverse-Flash costume, he snatches Eiling from the military base and speeds him to the Central City sewers. Wells pulls off his mask in front of Eiling and reveals himself as a metahuman, saying he “protects his own.” Hearing a growl, Eiling wonders what is down there with them, and Harrison states that it is an old friend of theirs. Suddenly, the general hears a voice in his head, and we see Grodd walking down the hallway. Eiling exclaims “My God!,” but Grodd corrects him (“Not God. Grodd”) and drags the general away screaming. 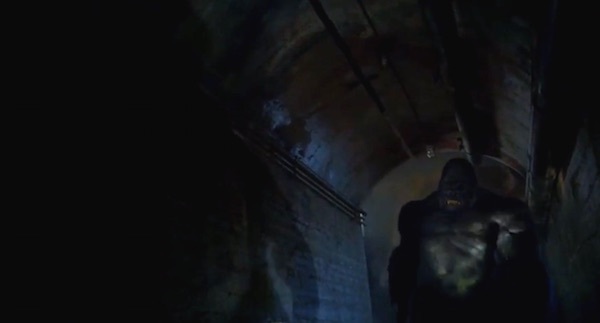 Admittedly, Grodd still stuck to the shadows in “Fallout,” but this time we were able to see his whole body. Because the Central City sewer system doesn’t have great lighting, here is a brightened screenshot of the gorilla in all his glory. 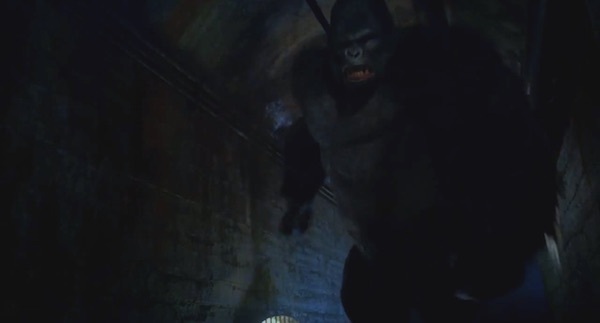 After being introduced in “Plastique,” Grodd reappeared in the last minutes of “Crazy For You” when he attacked two maintenance workers who were checking on some faulty wiring in the sewage system. Since the particle accelerator explosion, not only has he become super-intelligent, but he also seems to have developed telepathy. As for what he’s been doing since his transformation, his spare time seems to be occupied by etching his name into the wall and attacking unsuspecting humans. It also seems Wells kept track of Grodd’s whereabouts, although it’s unclear whether those two have an official alliance. As for Eiling, it was left ambiguous whether Grodd will rip him apart or keep him alive to torture. If it’s the former, then Eiling certainly deserves what’s coming to him. If it’s the latter, it would be interesting if Grodd were able to mentally control Eiling and use him as his puppet on the surface. Let’s be real, the gorilla doesn’t exactly blend in, but with a military officer under his control, he can use that to his advantage. Perhaps he has a plan that Eiling’s authority can help accomplish. Grodd’s role on the show is still a mystery. However, it’s likely this isn’t the last we’ve seen of him this season, so ideally the writers will give fans more answers in the coming months.